I recently spent a weekend with some of the most adventurous and inventive minds in the RepRap world at the Midwest RepRap Festival. Never heard of the RepRap community? RepRap was founded on the idea of self replicating manufacturing machines, making 3D printing affordable. Without them, you wouldn't likely have heard about 3D printing. I demonstrated two BeagleBone Black projects at the event to illustrate machine control under Linux. The first was EVB, a cape that enables use of LEGO MINDSTORMS motors and sensors. The second was Machinekit for 3D printing, the same software used in heavy industrial CNC mills. This breadth on one platform is unique to Beagle and a big part of why it continues to grow in popularity and enabling new open source projects. Of course, what I enjoyed speaking to the RepRap folks the most was the opportunity to teach others and bring them into the community. As I encouraged them, I'll encourage you, because there is still time to get involved to mentor students during Google's Summer of Code. We have a large number of applications to filter through and students anxious to start contributing to the state of open source machine control. Have a 3D printer? You can help a child this Spring! 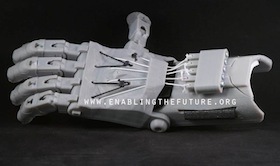 Ja Staes has written an article in Detroit Daily about the upcoming Penguicon event as well as their support of the "Enabling The Future" group's effort to provide 3D printed prosthetics for children who have lost hands and wrists. If you own a 3D printer, the members of the of Penguicon community are donating the raw material required to produce the prosthetics. Various sizes are requested to satisfy the needs of clinics with various flesh tones, making the strategy of 3D printing the most reasonable approach at this time. Take a read of the article, download the models, print some hands and come out to this amazing event. 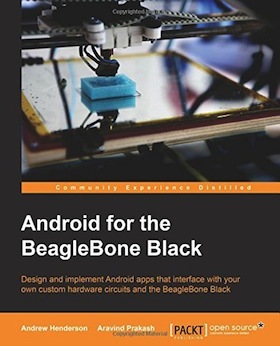 Andrew Henderson and Aravind Prakash provide an introduction to BeagleBone Black for the Android app developer, no hardware experience required. This book is great for those looking to turn applications into appliances. On March 31, MCM Electronics is facing off BeagleBone Black and Raspberry Pi 2 in their Maker Madness popularity contest and give-away on Facebook. Be sure to show up and comment to vote for "BBB". 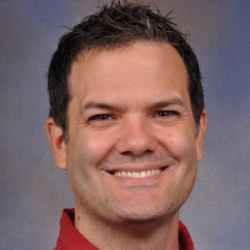 As of March 1st, beagleboard.org/latest-images has been updated to a newer Debian image to encourage more users to try it out and provide feedback. Almost all of the feedback has been very positive, but some users have had confusion because the image doesn't automatically re-flash the on-board eMMC. This is intentional to drive users to try the image out without altering the contents of their current on-board image. If you do want to write the image to your on-board flash, the rather simple process is discussed in this thread. Numerous presentations at the annual Embedded Linux Conference spoke about the suitability of BeagleBone Black for many applications, including how it is "perfect for drones". 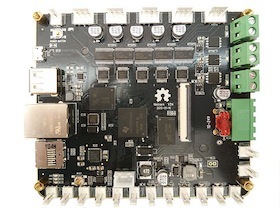 A derivative of BeagleBone Black and Elias Bakken's Replicape, Truby Zong has released a Kickstarter project with an all-in-one 3D printer controller board starting at the crazy low price of $79. 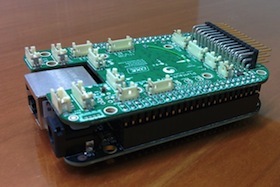 Thanks to the programmable real-time units (PRUs) on the TI Sitara AM3358 and the Xenomai real-time kernel running on the ARM Cortex-A8 under Linux, this all-in-one controller provides both fast, predictable stepper motor control under complex geometries, beyond cartesian and delta printer configurations, as well as networked-based printing and USB webcam based print monitoring. Feel encouraged to back this Kickstarter and to request Truby to support Elias in the work he did to enable this project. Mentor Graphics has released reference source for BeagleBone Black's design for their PADS PCB design software. This adds to the ports to Upverter and Altium, as well as the original source for Allegro. The Erle Robotics team has started a crowd-funding campaign on Indiegogo for their PixHawk Fire cape to turn BeagleBone Black into an Ubuntu-based unmanned aeriel vehicle.